Here are some of the Smart Planning tools and resources, archived here for research and reference. Download the SPC research project investigating the application of integrated community sustainability planning (ICSP) by regional districts and small municipalities for rural areas of British Columbia. 3. The rural areas’ relationship with urban and provincial sustainability goals. The study was funded by the Pacific Institute for Climate Solutions (PICS). Further information resources on integrated and comprehensive community sustainability planning. The BC Climate Action Toolkit is an online resource for knowledge sharing and collaboration. It provides the latest news, best practices, practical advice, information and strategic guidance to help BC local governments successfully reduce greenhouse gas emissions and, at the same time, strengthen their communities. 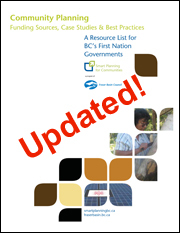 This Toolkit is provided by a three-way partnership of the Province, the Union of British Columbia Municipalities and Smart Planning for Communities, a program of the Fraser Basin Council. 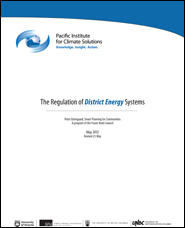 District energy systems are promoted as a way to provide low carbon heat and hot water. In British Columbia, most systems are “public utilities” and regulated by the BC Utilities Commission (BCUC) unless the services are provided by a local government. This paper examines nine diverse systems, four under BCUC jurisdiction and five regulated by municipalities, to elicit the type and level of economic regulation that can encourage financial sustainability while providing customers with reasonably priced energy services. Download the paper. Several First Nations communities in British Columbia are moving towards a sustainable future. These communities have requested increased access to expertise, networks and information. This document provides links to resources for planning well such as frameworks and funding opportunities. This Planning Resource also lists Success Stories and Best Practices from communities actively working to improve opportunities for today’s generation and for the community seven generations from now. Program Coordinator. Smart Planning for Communities: creating stronger more vibrant and sustainable communities in British Columbia. for Smart Planning for Communities program, a specialized advisory group including funders, experts in community sustainability planning and implementation will guide the SPC Program with the necessary strategic and operational guidance over the next three years. We’re close at hand and happy to help! See our Smart Planning for Communities Contacts page to connect with facilitators and other program staff. SPC is a program of the Fraser Basin Council, a charitable non-profit society that works to advance sustainability in the Fraser River Basin and across BC. For more information on the Fraser Basin Council please visit: www.fraserbasin.bc.ca.